Some of the footage is jaw dropping: cars pucker and scrunch, tires screech. And, in the most heinous cases, people are injured or killed. American Traffic Solutions (ATS) is the company that provides most of the traffic cameras that capture red-light running incidents on Florida roadways. If you or a loved one is involved in an accident involving a vehicle that ran a red light, it would be wise to consult an aggressive personal injury attorney. Left turns are allowed on red lights after a complete stop when the destination and origin streets are one-way streets. Yellow lights are a warning; you must have passed the crosswalk or entered the intersection on yellow in order to be within the law. You can plan on a $125 ticket and 3 points against your driver’s license for running a red light or stop sign. If you’re captured on a red light camera, the ticket jumps to $158, with no points. T-Bones: Common intersection crash types, side-on crashes can be particularly serious, even at speeds that are relatively slow. Individuals on the side of the impact are vulnerable to chest and lower extremity injuries. The pelvis and abdomen are at serious risk. The human body is simply no match for door panels that cave in with extreme force. For individuals on the non-impact side of the vehicle, head and chest injuries are most common. Head-on Collisions: Chest and lower-limb injuries are common to individuals who are using seatbelts. For those who are not belted, studies indicate that the damage suffered can be much more severe, including facial damage, and serious damage to the chest, pelvis, legs and feet. If you or a loved one experiences a collision due to the recklessness of another driver, you deserve justice. 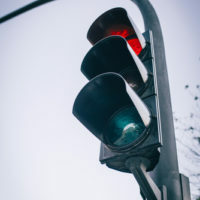 Whether the incident involved running a red light or some other traffic violation, the experienced team at the Law Offices of Robert W. Elton will investigate and fight on your behalf. Contact us in Daytona & Ormond Beach today for a free, confidential consultation.